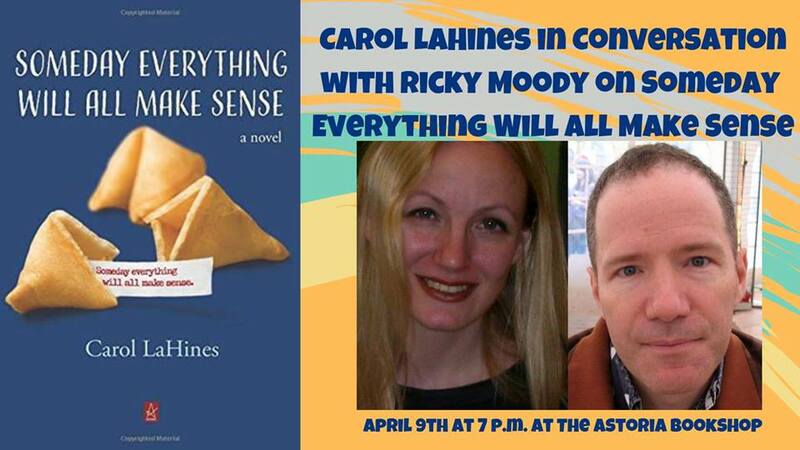 Join us April 9th for Carol LaHines, author of Someday Everything Will All Make Sense, in conversation with Rick Moody, author of Hotels of North America. Someday Everything Will All Make Sense is a humorous and moving exploration of loss and bereavement, narrated by Luther van der Loon, a harpsichord virtuoso and professor of medieval music at a New York university. When Luther’s mother chokes on a wonton from Seven Happiness Chinese take-out, his attempts to dislodge the foreign body airway obstruction (FBAO) prove futile, and his mother dies en route to the hospital. At 45 years of age, Luther is finally, irreparably, alone. His passage through the stages of grief is not straightforward. He obsesses over burial practices, rails against M & Sons Chapel and the funerary industry, and institutes a personal injury suit against Seven Happiness and its owner Bernice Wong, whose “sloppy methods” he blames for his mother’s death. Eventually, Luther learns to come to terms with his loss. Luther detests modern music and the equal temperament, the tuning convention whereby the octave was artificially divided into twelve equidistant steps. He believes, like Kepler and the greatest thinkers of the Renaissance, that music is constructed according to the divine Pythagorean ratios. The novel speaks to the absurdity of the legal system as a means of redressing our grievances, as well as to the universality of the loss suffered by the protagonist.